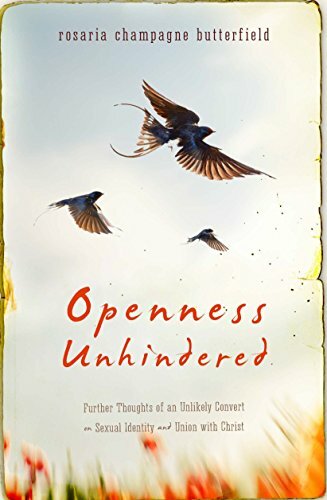 I was recently given the opportunity by Crown & Covenant Publications to review Rosaria Champagne Butterfield's latest book Openness Unhindered. Butterfield has a rather interesting testimony of conversion. A foundational member in her LGBT community, and professor of literature, Butterfield had a rather riveting conversion to Christianity. Her latest book is subtitled "Further Thoughts of an Unlikely Convert on Sexual Identity and Union with Christ." It was very hard to for me to pass on an opportunity to read this book. Before an official review, I would like to highlight some provocative quotes and thoughts. Butterfield has a way with words and I hope to not add any personal flavor to her honest tone. This quote about the general hospitality of Butterfield and her partner made me chuckle. Despite what Reformed individuals must confess about Total Depravity, it never means that people are as bad as they possibly could be. In fact, Butterfield has a great section discussing how the LGBT community often utilizes "common grace" better than the Church. But this "common grace" is not to be compared with the fruit wrought from union with Christ. Come courtesy never communicates Christianity, but when it is fruit from the root, Christ, it can have an impact. Let us endeavor then to treat all men as neighbors in Christ. Especially, those who hate us. Let it be our "kindness, gentleness, self-control" that helps us convert people just as Paul said, "God's kindness is meant to lead you to repentance" (Rom. 2:4). I have read very few comments that have made me nod my head in all directions than this one. How many of us have heard testimonies of how important a previous sinful life was to "making people what they are today?" And yet, this is completely false. The only thing that can make us better ministers and witness in God's kingdom is God's word. Just as the sinful nature of non-believers does not work righteous wisdom or insight in the world, so also the sinful past of the believe does not add to their wisdom or insight. That said, God does work all things together for His purpose and our good. Some might think that this quote almost contradicts the previous quote. I will allow the context between them to give a full explanation to the eager reader. However, let me merely state that while we must always affirm God's position and the Biblical worldview, this does not negate the importance of human experience. Instead, we learn that human experience is important so long as it is not utilized to contradict Scripture. This means that real community will require that we listen to stories of sinners without affirming the sin. It means that we will listen with ears that affirm God's perspective. It just so happens that is is a perspective of mercy, grace, and forgivness — found in union with Christ.